Donald Trump and John Kelly Just Came Out as BFFs, so Kelly’s About to Get Fired, Right? Donald Trump spoke up Friday to refute rumors that there is drama between him and his chief of staff, John Kelly, that could lead to a potential ousting of the ex-Marine whom many have labeled “the adult” in the White House. 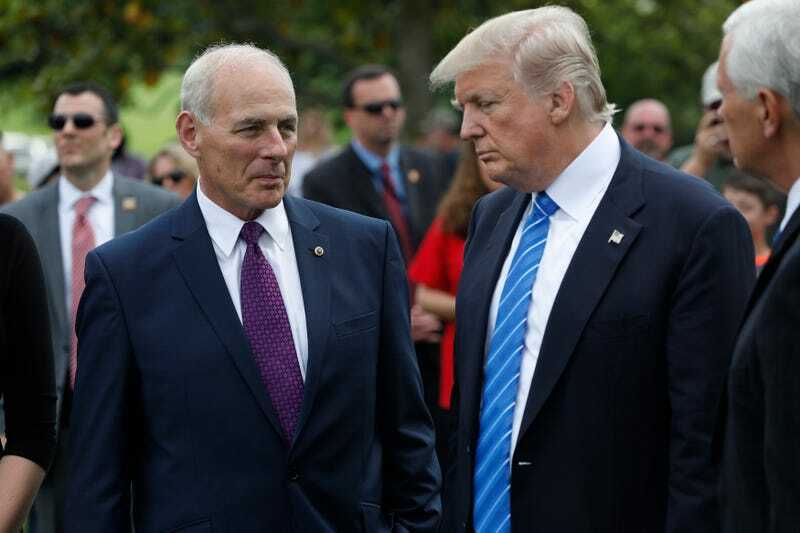 The Associated Press reports that the president said Kelly is “doing a fantastic job” and made a show of walking with the chief of staff to Air Force One as Trump prepared to leave for a National Rifle Association convention in Dallas. For his part, Kelly said that everything at the White House was going “phenomenally well,” which runs in direct contrast with his previous statements and actions, including his threats to quit his job at the White House on several occasions. On Monday, NBC News reported that Kelly had called Trump an idiot, and that remark was confirmed to AP by a former administration official who is not authorized to speak publicly about private discussions. All of this mutual knob-slobbing runs counter to things both men have said about each other recently. According to AP, Kelly has told others that he acts as a guardrail, protecting the American people from Trump. Trump has expressed displeasure with a Fox News interview Kelly did earlier this year during which he suggested that the president’s thinking had “evolved” with regard to the infamous proposed border wall between the U.S. and Mexico. His faith in Kelly was further shaken after the apparent mishandling of domestic violence allegations against now former White House Staff Secretary Rob Porter. Of course, we all know that every time Trump comes out to say he’s cool with a member of his administration, that person immediately gets wished away to the cornfield. We have seen it happen time and time again. So what’s the over/under on how much longer Kelly lasts, now that Trump has issued the death note? I’m taking bets, rumors, speculation and conjecture in the comments as usual. Let me know what you think. How much longer will John Kelly last in the White House?